One of the best parks to visit in the Phoenix metro area, Pagago Park is also one of the most scenic and easily accessible desert areas in the greater Phoenix area. It is located in the heart of the city, where Tempe, Scottsdale and Phoenix meet, making it extremely accessible from all parts of the metro area. The park's 1,500 acres are filled with rolling hills, over 10 miles of hiking and biking trails that showcase the famed saguaros and other cacti, picnic areas, and lagoons. The park is also home to attractions including the Desert Botanical Garden, the Phoenix Zoo and the AZ Heritage Center at Papago Park. With all the attractions and trails located inside the park, there's plenty to do, but here are a couple of the popular attractions to check out on your visit there. Governor Hunt’s Tomb: Standing tall on a hill and visible throughout the park is a white pyramid that serves as a tomb for the state's first governor, George Hunt. Walk up to the top for views of the surrounding area, including a unique view to the inside of the Phoenix Zoo. 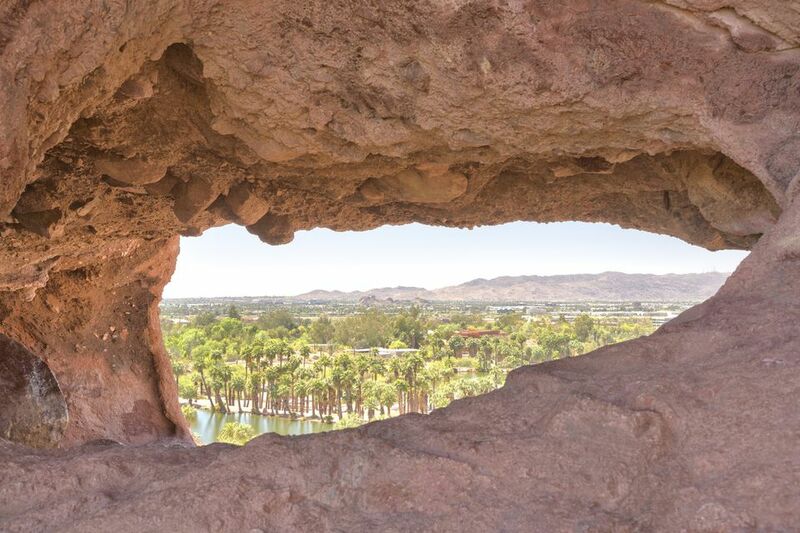 Hole-In-The-Rock: One of the more popular photo options at Papago Park is an intriguing formation on the park's east side, which features a main chamber that looks out over nearby lagoons and the distant downtown skyline. The trail to the chamber involves steps that rise 200 feet in just a short 0.10 miles. The formation is thought to have been used by the ancient Hohokam civilization to track the position of the sun through a hole in the rock "ceiling." If you're looking for a more active visit, or the best hikes to reach the attractions mentioned above, consider taking one of these trails. Crosscut Canal Path: This trail runs along the canal on the dirt and concrete banks of the canal. The trail passes by the Desert Botanical Garden and The Phoenix Zoo. There are many entrance and exit points along the trail. Access: Start at the Hole-in-the-Rock Trail, and proceed left to access Crosscut Canal Trail. Galvin Bikeway Trail: The Galvin Bikeway Trail connects the Desert Botanical Garden, Papago Park, and the Phoenix Zoo. This concrete pathway provides access to a bus stop on Van Buren St. The Galvin Bikeway Trail runs parallel to Galvin Pkwy along the east side of the roadway. Access: Start at the Papago Park entrance, and proceed to Galvin Bikeway Trail. Hole-in-the-Rock Trail: This is a very short natural dirt and step path that wraps around Hole-in-the-Rock Butte and leads to a large, wind-eroded hole. Access: Start at the Papago Park Visitor Center, and proceed to Hole-in-the-Rock Trail. Double Butte Loop Trail: This natural trail traverses the circumference of both the small butte near the parking lot and the larger double buttes. Access: Start at the West Park Drive parking lot. Proceed north to the Double Butte Loop Trail. Elliot Ramada Loop Trail: This loop trail is a beautiful trail that has a wonderful ramada rest stop at the halfway point. This trail also provides spectacular views of the downtown corridor, and several benches are placed along the paved portion of the trail. Access: Start at the West Park Drive parking lot. Proceed north to the Elliot Ramada Loop Trail. Papago Park Fitness Trail: This one is an enjoyable, multi-use, crushed granite trail that navigates the western portion of Papago Park. There are multiple outdoor exercise stations along the trail, and each exercise station provides an opportunity to stretch or strengthen different muscle groups. While traversing the trail, you might encounter wildlife and birds as well as a variety of native Sonoran Desert plants. There are two shade ramadas and drinking fountains along the trail, but restrooms are not available along the Papago Park Fitness Trail. Access: Start at the West Park Drive parking lot. Proceed north to the Papago Park Fitness Trail. The trails are divided between Papago Park and Papago West Park. You can consult this city website to find the trail that you want to try and then how to get there. Papago Park's trailhead hours are 5 a.m. to 7 p.m., and West Papago Park's trailhead hours are sunrise to sunset. Papago Park is home two of the regions most visited attractions, the world-class Phoenix Zoo and the breathtaking Desert Botanical Garden. Additionally, the park boasts an archery range, orienteering course, Papago Ponds fishing lagoon, the Hall of Flame Museum, Papago Park Baseball/Softball Complex, and the Papago Golf Course, home of the Arizona State Sun Devils' golf team.